Pictured, Jake Adam Bilotta and Ian Reilly McClurg. Police bookings via Seminole County Sheriff’s Office. Jake Adam Bilotta and Ian Reilly McClurg indicted in the murder of a former roommate who they believed to have stolen their Playstation4 game console. How much is a Playstation really worth anyway? Two Florida men are facing first-degree murder charges after fatally stabbing their former roommate over a stolen PlayStation 4. 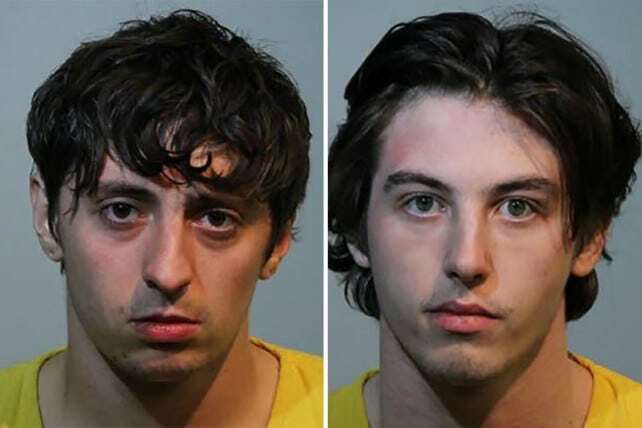 Jake Adam Bilotta, 22, and Ian Reilly McClurg, 21, lured their former roommate to a residence they shared in Maitland after suspecting him of stealing the $300 game console several days earlier. “That really aggravated Jake, and Jake and Ian had made plans to try to get him lured back over under the premise that they were going to come together and go to a party,’ Seminole County Sheriff Dennis Lemma told reporters Tuesday. The victim — who was not identified pending family notification — was met late Monday at the home by Bilotta, who then stabbed him multiple times with a 7-inch chef’s knife according to News Channel 20. The killing plan may have worked save for the fact that a third roommate walking in during the disposal part of the crime. Walter Johnson had returned to the men’s South Boulevard residence after a Tinder date- only to find McClurg with a knife in his hand along with Bilotta putting the victim’s body inside plastic garbage bags. ‘The plan was to kill him, put him in plastic bags and then find someplace to bury him,’ Lemma told reporters. Johnson then returned to his car, where his date had been waiting, and called police. McClurg was arrested by responding deputies inside a bathroom. Bilotta was taken into custody after a police helicopter tracked him down to a parking lot about a mile away from the home. McClurg at the time had been staring at Johnson as he held the large knife, he told police, prompting him to grab it and throw it onto a bedroom floor, according to the police report. Johnson and another resident of the home have not been charged in the fatal attack, sheriff officials said. Both Bilotta and McClurg remained held without bail in a Seminole County jail as of Wednesday, online records show.